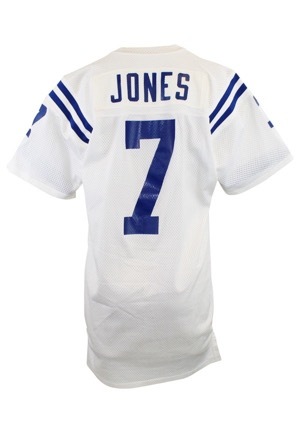 Former NFL MVP Bert Jones wore this jersey in the 1970s with the Baltimore Colts. On the front left tail is the Sand-Knit manufacturer’s tag size “46”. 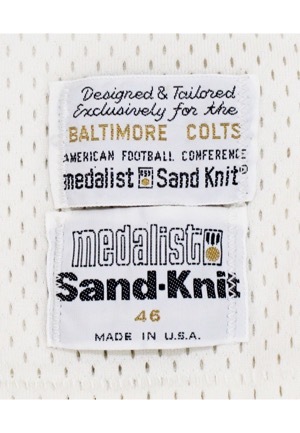 Adjacent above is the “Designed & Tailored Exclusively for the BALTIMORE COLTS” tag. 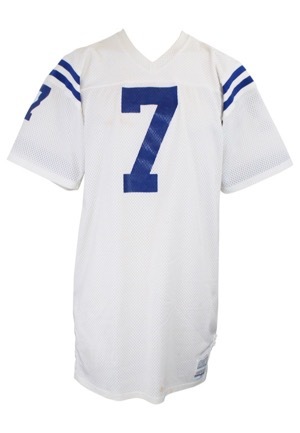 On the front, back and on both sleeves is the player number “7”. Across the back on a white nameplate is the player name “JONES”. All numbering and lettering is done in blue vinyl. This jersey is properly tagged, was presented to us as game-used and in our opinion shows appropriate use.